Senior Airman Mutia Graham, Air Force Test Center, walks through a formation of sabers during Air Force Materiel Command’s Annual Excellence Awards Banquet March 6, 2019, at Wright-Patterson Air Force Base, Ohio. Senior Airman Mutia M. Graham of the 412th Aerospace Medicine Squadron at Edwards Air Force Base, Calif., is one of Air Force Materiel Command’s top Airmen for 2018. 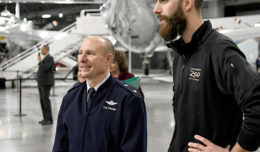 The Annual Excellence Awards Banquet for the command was held March 6 in the Modern Flight Gallery of the National Museum of the United States Air Force at Wright-Patterson Air Force Base, Ohio. 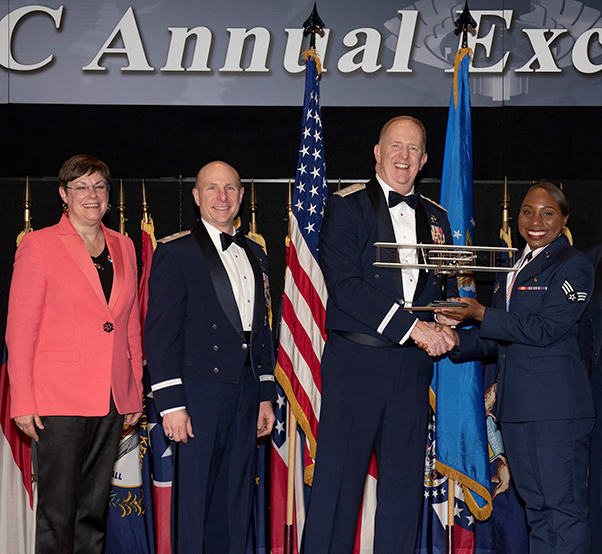 From left: Patricia M. Young, Air Force Materiel Command executive director; Maj. Gen. Carl Schaefer, AFMC deputy commander; Lt. Gen. Robert McMurry, AFMC commander; and Senior Airman Mutia Graham, Air Force Test Center; pose for a photo during AFMC’s Annual Excellence Awards Banquet March 6, 2019, at Wright-Patterson Air Force Base, Ohio. McMurry presented Graham with a trophy for being selected as the command’s Airman of 2018. 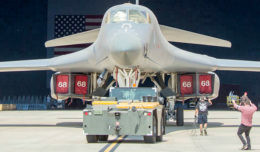 As a Bioenvironmental Engineering journeyman, Graham attacked overdue discrepancies and resolved compliance gaps, while filling a senior non-commissioned officer position for more than six weeks. In addition, Graham piloted a $52 million dollar ventilation testing program by evaluating shops and centralizing the chemicals used, thereby producing a safer working environment. She also led a 27 member team performing multiple hazardous air studies and certifying safety of work centers. 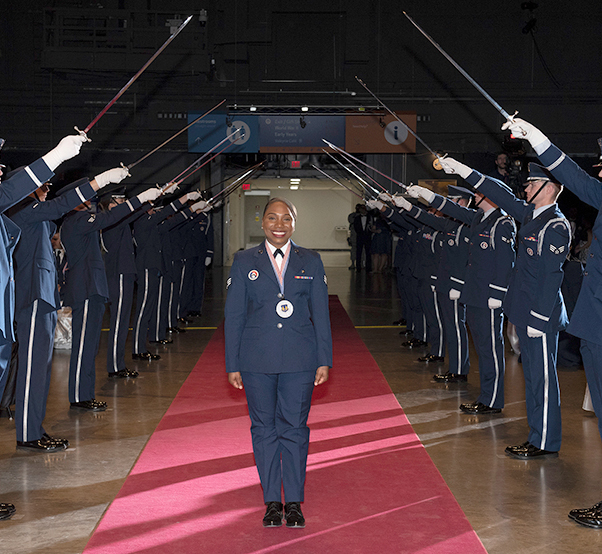 Graham also served as honor guard where she directed 132 details, trained 17 Airmen, and devoted over 400 hours performing honor guard duties.